Head to the Grand Canyon's west rim for the adventure of a lifetime! Once at the west rim, you will take to the skies in a helicopter for a flight to the canyon floor and a boat ride on the Colorado River. You will also have the opportunity to walk on the glass Skywalk for unparalleled views. 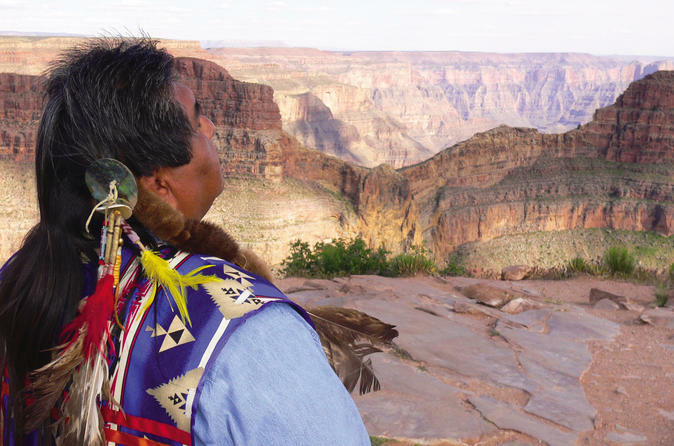 Your Grand Canyon day tour begins with an approximate 3.5-hour drive by luxury air-conditioned motor coach to the West Rim, home to the Hualapai Indians. At the Grand Canyon, you'll hop aboard a six-seat helicopter with large windows for a five-minute, slow descent to the Grand Canyon floor, approximately 4,000 feet (1,200 meters) below the rim! Once you've arrived at the base of the canyon, you'll board a pontoon boat for an approximate 15-minute ride down the Colorado River! You'll glide along the walls of the mighty Grand Canyon for approximately, then fly back up to the rim where you can board the shuttle bus which will take you to both Guano Point and Eagle Point. At Eagle Point, you can view the Hualapai Indian Village and purchase local souvenirs such as handmade crafts and jewelry. You can also take a step out onto the Skywalk, the glass bridge that juts our over the edge of the rim. Guano Point has the best views of the canyon, overlooking the Colorado River. You can take a walk around here and just take in the magnificent views. You can also make a stop at the Hualapai Ranch. Lunch is included and can be enjoyed at a number of different locations throughout the day. After you day at the Grand Canyon's west rim, you'll head back to Las Vegas by luxury coach. The fleet of luxury motor coaches are climate controlled and equipped with restrooms, reclining seats, video monitors and over-sized windows for your comfort and convenience.